Images of cats have gone viral long before the Internet, or even the computer, was a thing. A 19th century painting of cats that drew crowds and critical accolades in the analog era sold at Sotheby’s Tuesday for $826,000, almost three times the high pre-sale estimate. My Wife’s Lovers is a monumental 6-by-8.5-foot oil painting weighing 227 pounds, so heavy Sotheby’s had to construct a special wall to display it during the preview period. It was painted by Austrian artist Carl Kahler who specialized in horse racing scenes and had never painted a cat before he went to San Francisco in 1891. There he met Kate Birdsall Johnson, a wealthy philanthropist, art collector and animal lover who had begun buying fancy Angora cats during her travels in Europe in the 1880s and never stopped. Mrs. Johnson invited Carl to Buena Vista, the Johnsons’ country estate near Sonoma and home of the oldest winery in California, still in operation today. 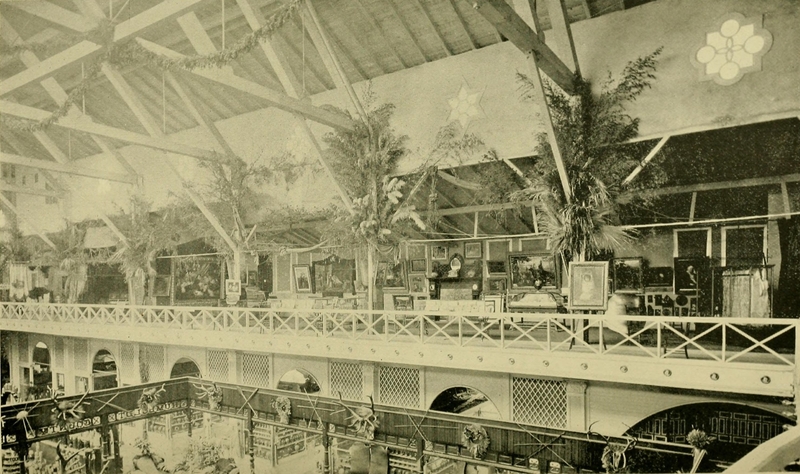 (It wasn’t actually a working concern in the decade plus the Johnsons lived there as they had no interest in wine production, but as aficionados of art and architecture, they did ensure the preservation of the original press house and winery so the estate could return to its proverbial roots after World War II.) There she commissioned him to make a portrait of 42 of her cats and Kahler got to work. He spent close to two years sketching individual cats in their many and varied postures. Lore has it that the painting was given its exquisite moniker by Kate’s husband Robert, but that can’t be true because he died in March of 1889 in Paris after a sudden illness struck him while he was traveling abroad. I imagine the name was Mrs. Johnson’s idea, a tribute to her beloved husband, doubtless inspired by something he had often said about her feline companions. It reads to me like an old inside joke between a long and happily married couple. 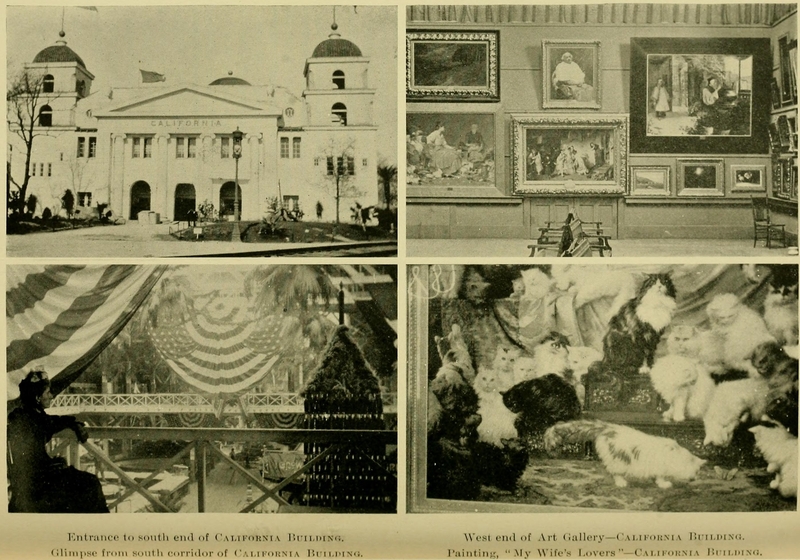 The pictures on the walls were numerous, and embraced novel and meritorious works of art. 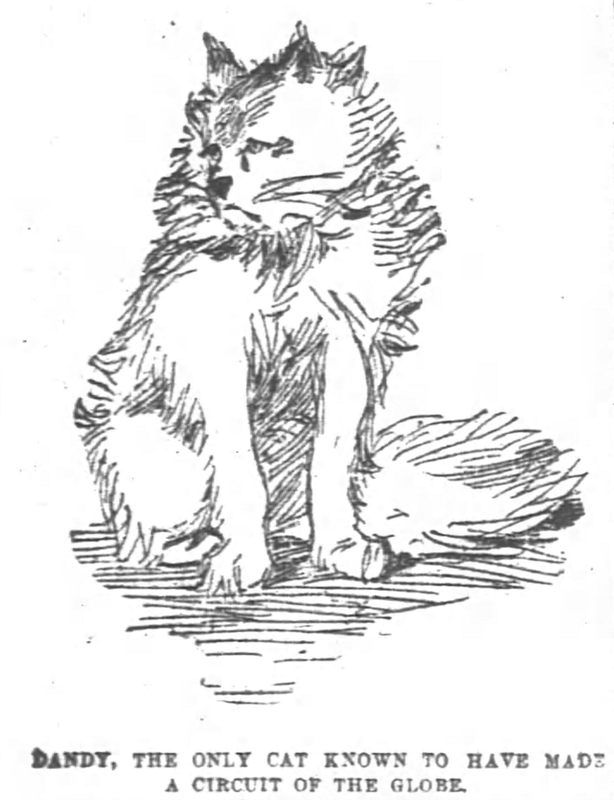 Probably the one that attracted the most attention was a large canvas painted by C. Kahler, and owned by the late Mrs. Kate E. Johnson of San Francisco, the title being “My Wife’s Lovers.” It contained figures of forty-two large Angora cats, being only a fraction of the total number in possession of the owner, and represented these household pets in every conceivable attitude of playfulness. Kate Birdsall Johnson only had a few months to enjoy her pets’ fame as live art models. She died on December 3rd, 1893, of pneumonia. Sotheby’s lot information says she left $500,000 in her will for the care in perpetuity of her cats, but that’s not correct. Her will was published in the paper when it was filed for probate a week after her death, and there is no half million dollar bequest. Thanking God for his undeserved mercies and acknowledging my grateful affection for my friend and father-in-law, the late George C. Johnson, through whom I am enabled to make the following gifts, I ask all who may receive them to pray for the repose of his soul. George C. Johnson’s soul may well have needed those prayers, primarily because of the way he made the fortune that Kate so graciously and devoutly bequeathed. A Norwegian immigrant, he first came to northern California in 1850 as captain of a ship carrying US Army food stores into the epicenter of the California Gold Rush of 1849. He sailed up the Sacramento River to its tributary the Feather River and stopped in Nicolaus, California, where he settled in waiting for further orders. Two years later, the army sent Major Richard Livingston Ogden, quartermaster of the Department of the Pacific, to track Johnson down. He found the ship permanently moored, draped with awnings, and Captain Johnson on deck swinging in a hammock while his wife rocked in a rocking chair. 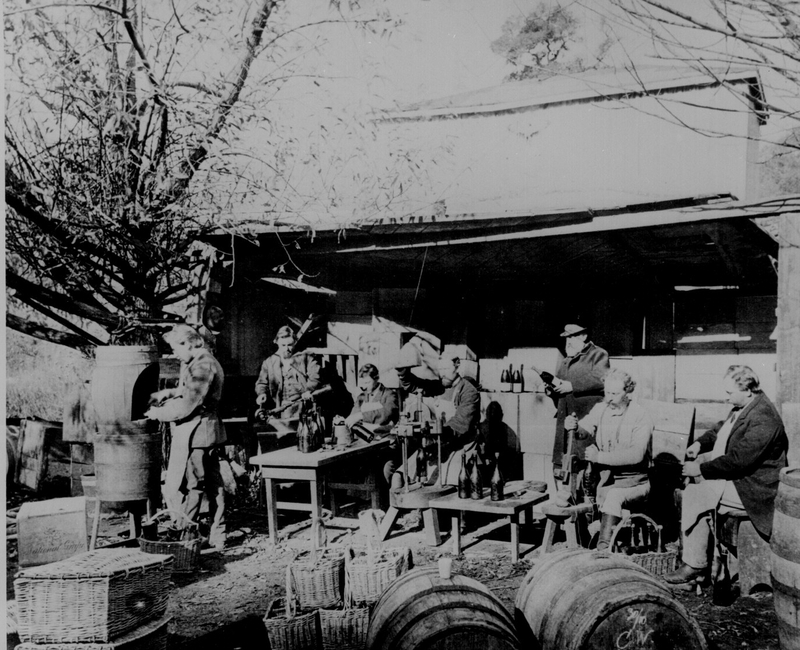 Ogden inspected the cargo, consisting mainly of barrels of salt pork, and found it no longer suitable for army consumption, or human consumption, really. So naturally he ordered it sold at auction where it was bought for a dollar a barrel. By George C. Johnson. Johnson rinsed the rust and stink off the pork, repackaged it and sold it in Marysville, a Gold Rush boom town, for $16 a barrel. He used the profits to invest in a San Francisco hardware business which was hugely successful, soon becoming the largest hardware company on the Pacific Northwest coast. By the end of the decade he was consul for Norway and Sweden and acting-consul for Denmark to the Port of San Francisco. George died in 1872, leaving his estate of an estimated $3 million to his only son Robert. By the time it got to Kate, the estate was worth around $2 million, much of it in property. She willed that a third of it be donated to the Roman Catholic Church for the purpose of building a free hospital for “all sick women and children of the poor, without regard to religion, nationality or color.” Mary’s Help Hospital took years to get off the ground, then more years to get back on its feet after the 1906 earthquake, but eventually Kate’s legacy was honored and the hospital still exists today as Seton Medical Center. There is no reference to Kate Johnson’s cats in her will. Apparently at the time cats had no legal designation — livestock qualified as personal property, but not pet cats — and therefore could not be explicitly provided for in her final will and testament. There is, however, a significant bequest of $20,000 to Helen Shellard “a maiden schoolteacher,” as the San Francisco Call describes her. Later articles note that Miss Shellard, a distant relative of Kate’s, had agreed while Kate was still alive to care for her cats after her death. Kate Johnson put the $20,000 bequest in her will specifically so Helen could afford to take on her many cats. Twenty thousand dollars in 1893 money is worth about $525,000 today, but that’s not where Sotheby’s got their spurious figure. They got it from an inaccurate 1949 article in the Shamokin News-Dispatch which also went wildly overboard with the total cat numbers. The papers at the time of her death claimed she had 200 cats; by 1949 that figure had grown to 350. Mrs. Johnson didn’t have hundreds of them, though, not even close. On February 1st, 1894, when Helen was finally able to sort out the technicalities and rescue the by-then neglected cats from Buena Vista, there were 32 of them. 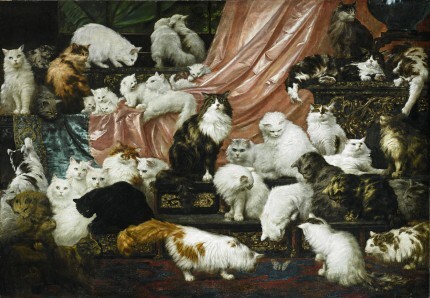 Given that, I strongly suspect the 42 cats in Kahler’s painting were the full complement of Kate’s cats in 1893. Mind you, 32 was more than enough for Miss Shellard’s modest Telegraph Hill home to accommodate. She had to evict two tenants, screen in a porch and some of the yard to make room for the Johnson cats. As for the painting, it led an exciting life after Mrs. Johnson left this one. It was purchased at her estate sale in 1894 by Ernest Haquette, a French-born art dealer who hung the painting in his Palace of Art gallery and cafe’, an innovative combination which made it a hot spot for the city’s social and business elite to enjoy elegant meals and cocktails for lunch and hugely expensive art any time. It was the best museum in the city before the de Young or SFMoMA were a twinkle in anyone’s eye. This entry was posted on Thursday, November 5th, 2015 at 11:29 PM	and is filed under Modern(ish). You can follow any responses to this entry through the RSS 2.0 feed. You can skip to the end and leave a response. Pinging is currently not allowed. Miss Kitty Burton IV purrs her approval! You posted this on a Thursday at 11:29 PM. I am baffled that you didn’t delay by 32 minutes in honour of the archaic internet tradition of Cats on Fridays. Come to think of it, you clearly expected the joke to be seen by people on this side of the Atlantic. Aha! Oh, nit picky, I know. Perhaps you meant to say that Captain Johnson’s hardware store was the largest on the Pacific Coast? The Pacific NW begins at the northern California border and runs to the Canadian border– though some might include the mountainous part of California north of Redding (others would include British Columbia as well). While San Francisco is located centrally on the Californian coast, residents there prefer to be considered in “northern California” to differentiate themselves from “southern California”, that uncouth place. But it definitely is NOT in the Pacific NW- either geographically or culturally! The portrait of the cats is quite striking. The cat in the middle reminds me of a 20 pound Norwegian Forest Cat who used to share my home. But to tell the truth, living with 32 cats would make me nuts. I checked my source and you’re right; it was the Pacific coast. So your nit was an entirely fair one to pick. Would you find it slightly less nuts-making if you lived in a Victorian Gothic castle and the cats had an entire floor to themselves complete with staff to tend to all their needs? Because I think I’d be okay with that. I’d certainly be okay with having enough money to be able to afford that! I made this painting my Wallpaper on my monitor. I noticed, when looking at the 43 inch screen, that the white cat, in the dead center of the picture, looking straight forward, seems to have a human face, and I wonder if it is a portrait of the lady? Any ideas on this? The anonymous buyer apparently has loaned this to the Portland Art Museum, where it’s expected to arrive today for a Wednesday unveiling.